A very early piece from the 1970s – I remember battling with the wall, most of the problems being created by the angle of shot. At the time it caused much heart ache, though I quite like it a a composition ploy now! This was a lesson in not being wedded to the photograph. The white (!) wall ran unchecked by plants in a strong diagonal, effectively cutting the picture in half. This line was echoed by the dark earth, the even darker fence and the grass. Luckily my tutor came to the rescue, solving the problems I didn’t know I had. 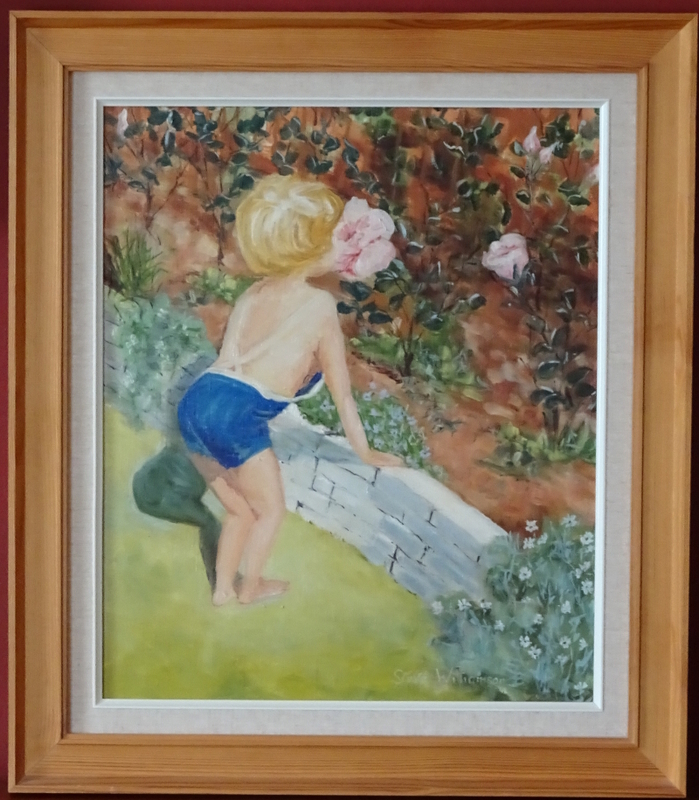 As instructed, I toned down the earth, the fence, and grass, and blued the face of the wall so that they all came towards the same tonal value, created two vigorous “Snow in summer” plants tumbling over the ends of the wall, and played up the shadow of the child. Her anatomy isn’t brilliant either, but I was thrilled with her hair – and I still am. Lessons you have been passing on, successfully I hope. Many thanks. Anatomy is always tricky. But doesn’t it make a wonderful evocation of a summer’s day!